There is a common pereception that the quality of life in American society is in decline and has been in decline for some time. Is this perception true and it what ways? If perception doesn't match reality, why? Over the next couple of weeks I am going to write several posts that look at social indicators. After that, I will offer some thoughts I have about what may be happening in our culture. I hope you will offer your insights and possibly suggest indicators you think would help clarify issues. Here are the first indicators. There are a number of factors that contribute to having a high quality of life. These include safe environments, adequate diet, adequate health care, sufficient education, adequate financial resources, nurturing families and communities, to name just a few. It is possible to find measures that tell us about each of the variables but when looking for broad quality of life measure, demographers tend to start with two measures. One is the infant mortality rate and the other is the life expectancy at birth. The infant mortality rate is the number of children that die from birth to 1 year of age per 1,000 live births. This measure is important because these children are the most vulnerable member of any society. Measuring how well the most vulnerable survive tells us something about the overall quality of life for a population. A second measure is life expectancy at birth. Everyone dies eventually but a society with a high quality of life will have organized itself to minimize the number of premature deaths in its population. 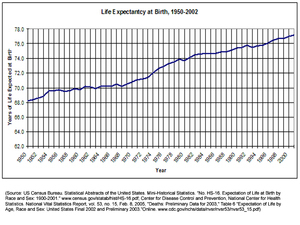 I'd be curious how the life expectancy at birth statistic is calculated. Among other things, if this is what it appears at face value, the two statistics would be interrelated. I suspect in the US decreased infant mortality, better nutrition, better water and sewerage would account for most of the increase in longevity -- but that's a gut reaction. I may be way off on how much these factors affect the overall population. I would suggest that at least two quality of life issues cannot be measured because they are intangible -- and perhaps as people talk about "decreasing" quality of life they are referring to such intangibles. Another quality of life issue is a sense of purpose. When survival was a larger component of life, people didn't worry so much about "purpose". They were consumed with the day by day work that had to be done. Beginning especially with the post WWII generation, parents have strived with some success to make sure that their children don't have those worries. (Yes, I know many on the margins have not experienced this change. But, for the majority it seems to have been true.) Now, rather than survival, issues of fulfillment and self-actualization take a larger prominence. A side effect of this is that life often seems to lack a sense of urgency or investment that it would have had in earlier times. Will, life expectancy is the average (mean) number of years a person can expect to live starting from a given age, in this case birth. 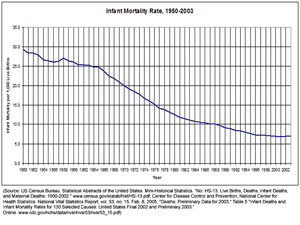 You are exactly right about the infant mortality rates being linked. In nations with high infant mortality the life expectancy sores for one year olds compared to those at birth. You hear that life expectancy was 30-40 in Jesus day but at least 1 in 4 deaths happened in the first year of life. Life expectancy for people who made it to their first birthday would be several years more. Morality and Purpose. I think you anticipate where I am headed with some of this. I hardly have definitive answers for the trends I see. It does strike me that even something intangible like purposelessness would result in higher rates of suicide and addictions. I would be very interested in reading more about what you see as I get this stuff posted.